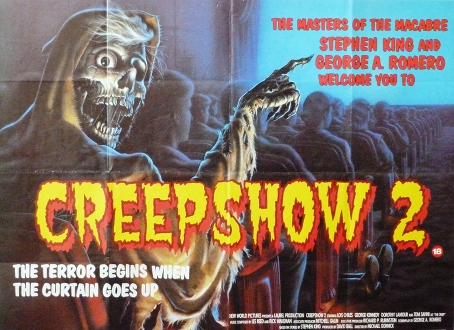 Creepshow 2 is the often overlooked sequel to the 1982 anthology horror film. This film once again brings together masters of horror Stephen King, George Romero and Tom Savini to give us 3 horror shorts of creeptacular fun. While not overall as strong as the original, this one still packs a punch. "The Raft" is the strongest of the 3 shorts and showcases a horrible oil monster that eats some rowdy teens. "Old Chief Wood'nhead" is a story that deals with the ramifications of when some hoodlums decide to rob a kindly old store owner. "The Hitchhiker" is a cautionary tale about what happens if you're involved in a hit and run. Pro tip...never run. The gore effects in this one are quite good and generally anthology films are pretty fun. These 3 shorts are bookended by a story about our friend Billy and told in animation to match the old pulp comic vibe. It's wonderfully done and really a lot of fun. If you've seen the original Creepshow and for some reason haven't taken the time to check this one, watch it. It's a fun time with just the right amount of creeps!